Forest Garden 6 x 10 Overlap Pressure Treated Apex Shed: The Forest Garden overlap pressure treated garden shed in 6 x 10 has plenty of length to it so that you can store a multitude of garden essentials, the double door coupled with the large size will allow you easy access in and out. This shed is constructed from rough sawn overlapping timber that is square cut to help the rain run freely off the sides, the timber used is also FSC certified and from a sustainable source. This shed benefits from having a durable pressure treated boarded floor and it has an OSB sheet material roof which will be covered by the included shed felt. 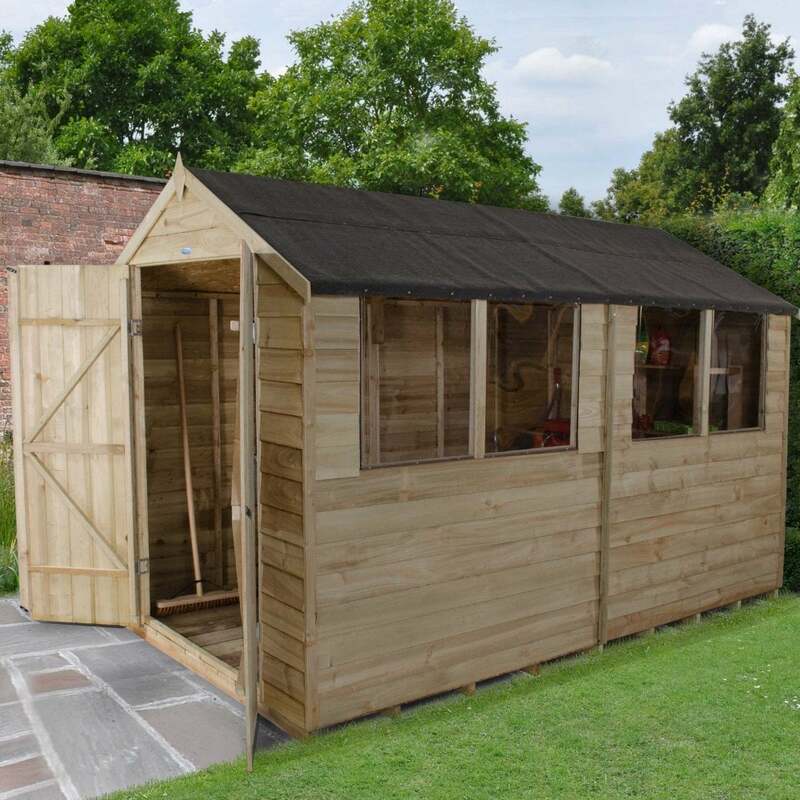 This wooden shed has 4 windows down one side and a double door to the front, the shed has a traditional appearance with an apex roof which will allow you to place this shed anywhere in the garden for a classic look and feel. This shed benefits from having added security features including hidden door hinges, security screws in the windows and virtually unbreakable polycarbonate glazing. The double door also has double Z framing for added strength and includes a hasp and staple lock. This Forest Garden shed is delivered flat packed for easy self-assembly.